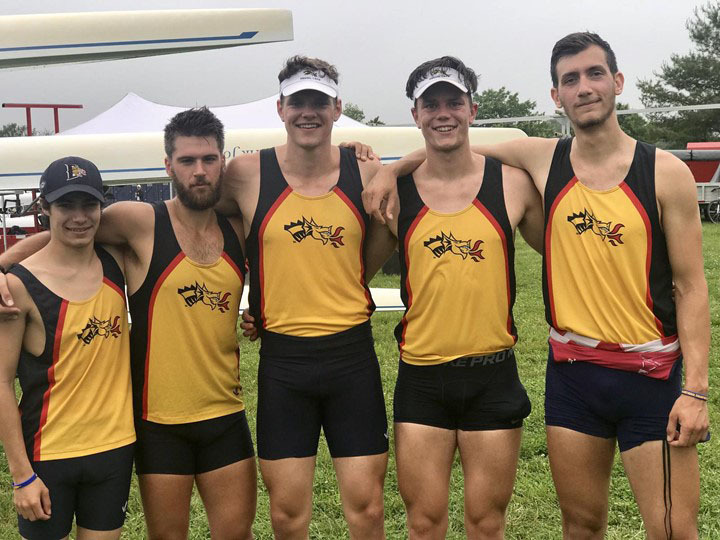 The Drexel University men’s crew team had the opportunity to compete in the Intercollegiate Rowing Association National Championships June 1-3 on Mercer Lake in West Windsor Township, New Jersey. The Drexel team headed into the weekend with a strong crew of sophomore coxswain Hunter Reed, stroke freshman Lazar Lazovic and juniors in 3-seat Justin Best, 2-seat Doug Davis and bow Dario Vracevic. After qualifying for the grand final with the third fastest time, the Drexel University men’s varsity four were deprived of the chance to compete for the national title. On the opening day of competition, the Dragons raced an impressive time of 6:27.888 to beat Georgetown University by more than six seconds. Brown University finished in third, with Northeastern University and Cornell University taking fourth and fifth. Of the 22 boats that were competing in the varsity four category, Drexel’s time was the second fastest across the four heats, boding well for the rest of the competition. Only the crew from the University of Washington managed to better Drexel in the first round, with a time of 6:26.658. The second day saw the Dragons cruise to another win in the semi-final with a time of 6:31.910. They took the top spot over Boston University by another huge margin of more than six seconds. The third team to qualify for the grand final was the College of Holy Cross, as they edged out fourth placed Georgetown by less than a second. This time the Drexel four qualified with the third fastest time in the competition, behind Washington (6:26.013) and the University of California Berkeley (6:27.943). Provisions were made to shorten the event in anticipation of the inclement weather, but unfortunately, the storm’s conditions caught up before the championship race could take place. This concludes the 2018 spring season for the Dragons. The team will return for preseason in the fall.